Finally, the results are up! I passed the CAIA Level II Exam !! It all started at the 69th CFA Annual Conference in Montréal back in 2016. I met William Kelly (President and CEO of CAIA Association) and he encouraged me to pursue the CAIA Program. I played with the idea for some time and finally, CAIA Institute launched the Stackable Program for CFA Charterholders. Among other things, the CAIA Level I Exam was waived. This was the sign I was waiting for! I couldn’t resist the opportunity, it was too good to miss! First, Why I did it? After going through the CFA Program in 2011, I thought that was it, no more exams for me! But, as you can imagine, our industry is always evolving and new products, strategies, and regulations come into place. The Alternative Investments industry is growing in Mexico and the CAIA Charter is recognized by the Mexican pensions regulator, CONSAR. Also, being a global Charter, I am confident it will improve my chances of landing a job elsewhere (my objective: Canada). The material covered also Private Equity, Real Assets, Intellectual Property (how to invest in Art and Movies, interesting), Structured Products, Commodities. Among the current readings, Blockchain was a good introduction to Cryptocurrencies and the associated tech. These readings help the CAIA Level II Curriculum to be at the edge of trends. The whole curriculum and readings were 1,200 pages long, in total. Considering my reading speed of 5 pages/hr (including taking personal notes), I spent a total of 240 hrs in the material. Relative to each CFA Exam which are 3,000 pages each and took me 300-350 hrs to study, this time it was a slower pace. Maybe it was that some concepts were new to me, or maybe I got rusty over the years. One thing that bothered me from time to time was: “as we saw in the CAIA Level I book”, “the basics were covered in Level I”. It made me wonder if I had the right background knowledge for the exam. As usual, I used the LOS to print a notebook, with enough spacing for notes. I am a visual person and writing and drawing help me remember easier. I don’t like writing on books so this time I used highlighting tape and LOTS of post-it notes. Exercises were in the post-its, so it was easy at the end to take them all and paste them for review. This method helped me first to organize my thoughts and trying to figure out my notes. Also, reading out loud is an excellent way to review, as visual and listening learning is combined. Mock exam: I did the mock exam included with the exam fee. It helped me realize that my weak spot was the formulas. But, my time was running out and I couldn’t do many exercises from the CAIA Workbook. Ex-post, I realize it was a good material that I didn’t take advantage from. As you may know, CAIA regulations don’t allow for exam content disclosure. But, I can say that It was fair, straightforward, based on the material and a little bit easier than a CFA Exam. The second section is open questions and at first, I thought 60 minutes were more than enough to complete. But in the end, Ethics questions were more difficult than what I had in mind, made me go over and over my answers, several times, so I just finished within the allotted time. Something I missed from the results email was the overall performance. I was used to getting a subject by subject performance percentile in CFA Exams. With CAIA, I don’t really know how well I performed in each section. Now I found my performance results at my CAIA Member website. Actual scores are not released. 62% of candidates of the Fall 2018 CAIA Level II exam passed. Performance is compared to the lower quartile of those passing candidates and reported in categories. For each topic, my relative performance was determined by comparing my performance (my Candidate Score, or CS) to the average score of the reference group (x), and the standard deviation of the scores of the reference group (σ). For example, a “comparable” results can be interpreted as x – 0.5×σ < CS ≤ x + 0.5×σ and Stronger means my was one and a half standard deviation above the comparison group mean, CS > x + 1.5×σ. My performance in Hedge Funds was way below the average relative to the lowest quartile of passing candidates. I knew this was the topic with more weight, so I this was the first one I read, back in June. For all other topics, I was surprised I was above the average. First, thanks to my family, Rosy, and Diego, who each time I get enrolled in some certification they support me. It’s not easy for the family, as most of my free time goes to prep. Secondly, thanks to all my CFA Charterholder colleagues (Sameer S, Alex H, Javier D) who also hold the CAIA and gave good advice and tips. I’d also like to thank the CAIA Association for letting me participate in this pilot Stackable Program for CFA Charterholders. Esta entrada fue publicada en CAIA y etiquetada en CAIA Exam, preparación el 11 noviembre, 2018 por Gustavo Espinosa, CFA, CAIA, CIPM. He estado interesado en la Certificación Chartered Alternative Investment Analyst (CAIA® ) por varios años y por fín este año se presentó una gran oportunidad. La Asociación CAIA inició un Programa Piloto para que CFA Charterholders puedan obtener la certificación CAIA únicamente presentando el examen Nivel II. Aprovechando este programa, ahora soy Candidato al Nivel II para el examen de Septiembre 2018. Nivel I: Se enfoca en las características de diferentes clases de inversiones alternativas, las herramientas y técnicas para evaluar sus perfiles de riesgo-rendimiento. Nivel II: La utilización de las inversiones alternativas desde un contexto de administración de portafolios. 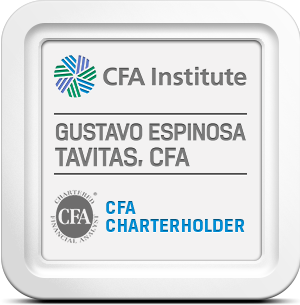 Consiste en un waiver del Examen CAIA Nivel I para que los CFA Charterholders puedan presentar directamente el examen Nivel II. Este Programa Piloto evaluará durante 2 a 8 ciclos de exámenes si los CFA Charterholders han obtenido el conocimiento de Inversiones Alternativas por medio de los examenes del Programa CFA. Solamente 500 CFA Cahrterholders serán aceptados en cada ciclo de examen. Este Programa Piloto permite obtener la certificación en la mitad del tiempo y costos. CAIA Level II Core Book, se vendepor separado, yo lo conseguí en Amazon durante el HotSale! Current & Integrated Topics. Lecturas y Papers de temas actuales. Por ejemplo, Blockchain. En total, son aproximadamente 1,200 páginas de estudio. Se recomienda dedicar por lo menos 200 horas de estudio. Me inscribí hace cuatro semanas, y llevo más de 350 páginas estudiadas. Esta entrada fue publicada en CAIA y etiquetada en CAIA el 30 junio, 2018 por Gustavo Espinosa, CFA, CAIA, CIPM.